Two ISR alumni have been granted tenure at their respective universities in recent weeks. ISR alumnae Dr. Saswati Sarkar has been promoted to associate professor with tenure in the University of Pennsylvania's Electrical and Systems Engineering Department. Sarkar's Ph.D. advisor was former ISR-affiliated faculty member Leandros Tassiulas. 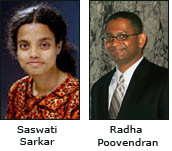 ISR alumnus Dr. Radha Poovendran has been promoted to associate professor with tenure by the University of Washington's Electrical Engineering Department. He won a Presidential Early Career Award for Scientists and Engineers (PECASE) in 2005. Poovendran's Ph.D. advisor was Professor John Baras (ECE/ISR).